Priced at $499 Unbelievable deal!! 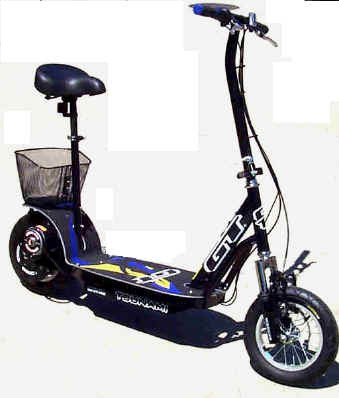 The 2004 GT Tsunami long-range front suspension electric scooter is an all around fun vehicle. Front fork suspension and a rectangular long-range Hi-Ten frame with power switch and charging port located above the deck for easier access. Top-end speed is approx 15 MPH with an average 15 mile range . The Exclusive Finned high torque motor will provide outstanding climbing capability. This is a serious scooter and suits the larger rider. New and improved with the rear band brake.